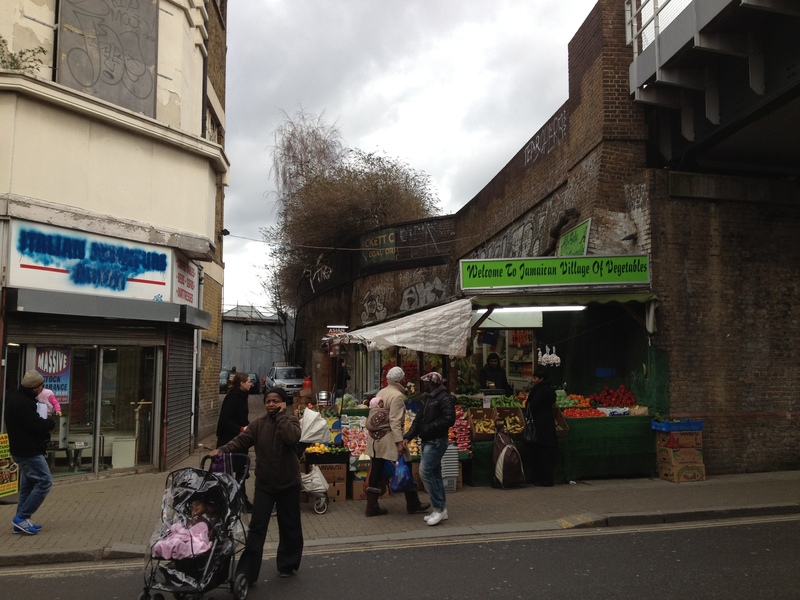 This month we’re sharing our plans for the Pockets along Rye Lane far and wide; we’ve been talking to various departments in Southwark Council, we’ve toured the pockets with Peckham People, it’s the Rye Lane Traders Association turn next and later we’ll be meeting with Southwark Cabinet Members, Cllr. Fiona Colley for Regeneration and Corporate Strategy and Cllr. Barrie Hargrove for Transport, Environment and Recycling. For those of you who haven’t been able to attend an event please look at the maps below to get a sense of what we’re planning for these spaces. To be clear, these are the very first sketches for the Pockets and are not at all set in stone. In fact these plans are likely to change after future discussions with any and all of the groups mentioned above. We would love to get your feedback on these early plans and if anything is unclear you can comment below or drop me a line at hannah.padgett@sustrans.org.uk. Unify the park area using a different surface treatment to the pavement and road. Design a play trail the length of the park – climbing boulders, integrated shapes in lawn etc. Seating – benches around tree trunks, integrated seats in planters, flexible seating with tables and chairs managed by local cafe/businesses. Street audit leading to removal of bollards and where necessary replacement with planters or similar. Also removal of knee rail around park border. A green growing wall on the back of McDonalds to soften the aspect to Rye Lane and to absorb pollution and noise. Artwork on adjacent walls across Rye Lane visually links the two spaces across the busy high street. Surface treatment on Rye Lane itself in relevant colours/pattern to suggest a raised table (pavement level section of road) to interupt the linear route down Rye Lane and cause uncertainty for drivers at a high intensity pedestrian area. Provide visual cues – match the colour of the seating parasol with the canopy of the market stalls on the corners of Elm and Holly Grove and across Rye Lane. Inner city forest – galvanised steel industrial bins with trees planted inside, with benches to be fixed between some of them. Peckham hall of fame – portraits of Peckham residents large scale displayed across the wall. Chalkboard as a visual conversation space. Reinstate gobo projector to poject motifs/logos/artwork on the screen above the cinema. Canopy of lights stretching the length of the corridor to the side of the multistorey carpark reduces crime and increases the feeling of safety. Mirrors to enable people to see around the corner as they walk into the corridor. Artwork across the scaffolding wall either appearing as an illusion or simply a mural to disguise the yard wall. A deep clean to make the space more pleasent to spend time in. 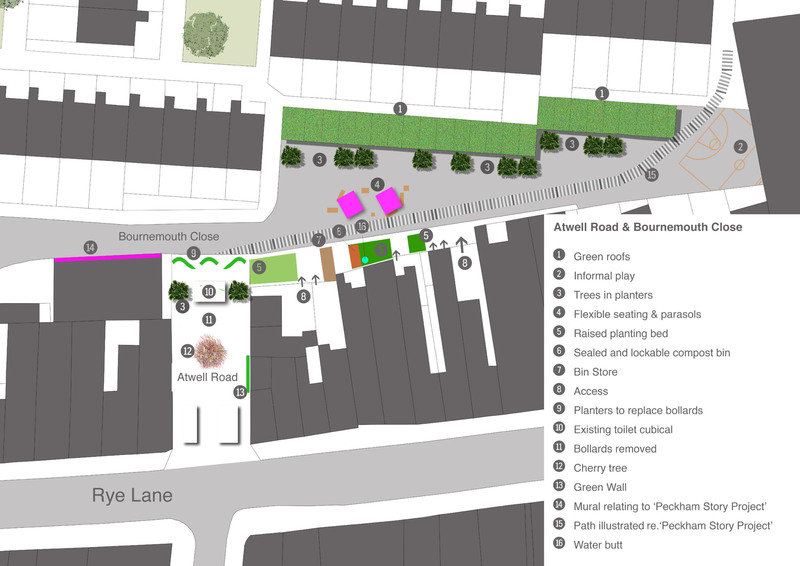 Flexible seating working with existing businesses, particularly hot food stalls, in the area. 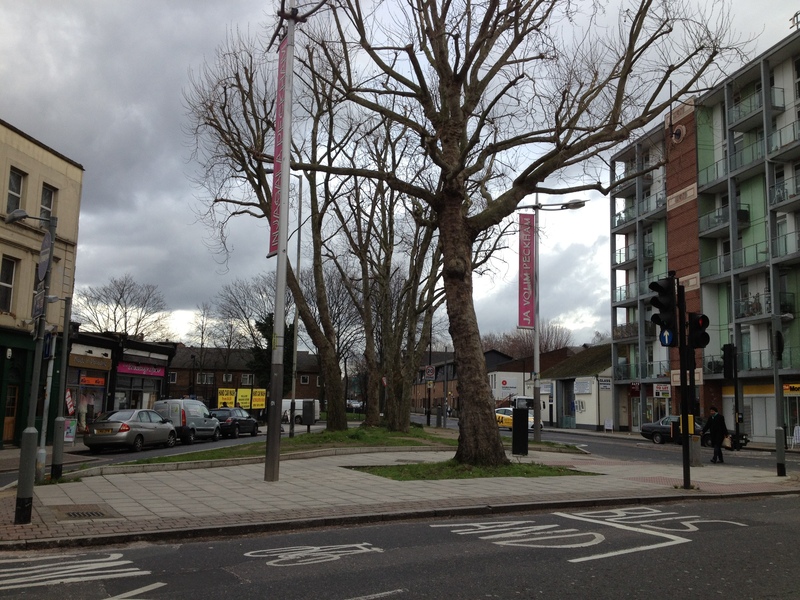 Residents have fought several times to keep this as open space but it is currently only a car park. 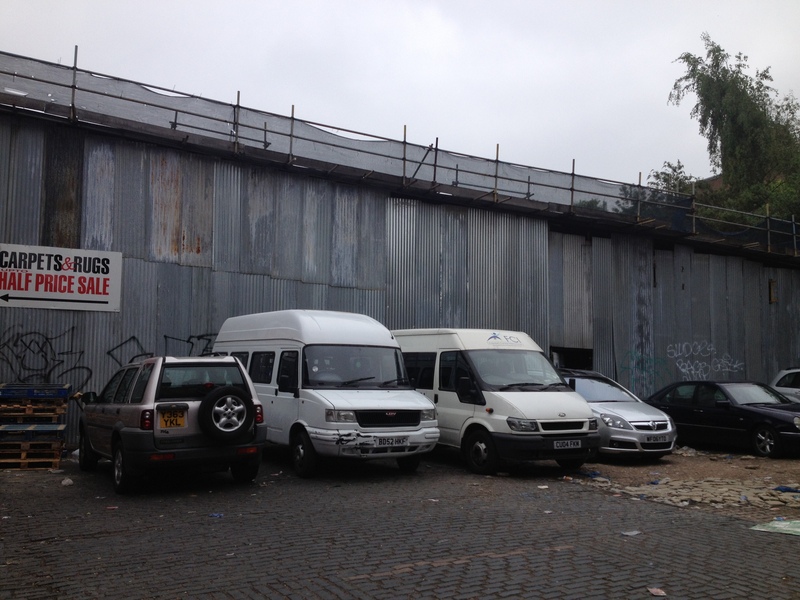 We propose a dual use solution where the car park doubles as a venue for film screenings, music and street food. In the circular area a modern day bandstand will provide a permanent more intimate venue for performance, busking, and speaking. 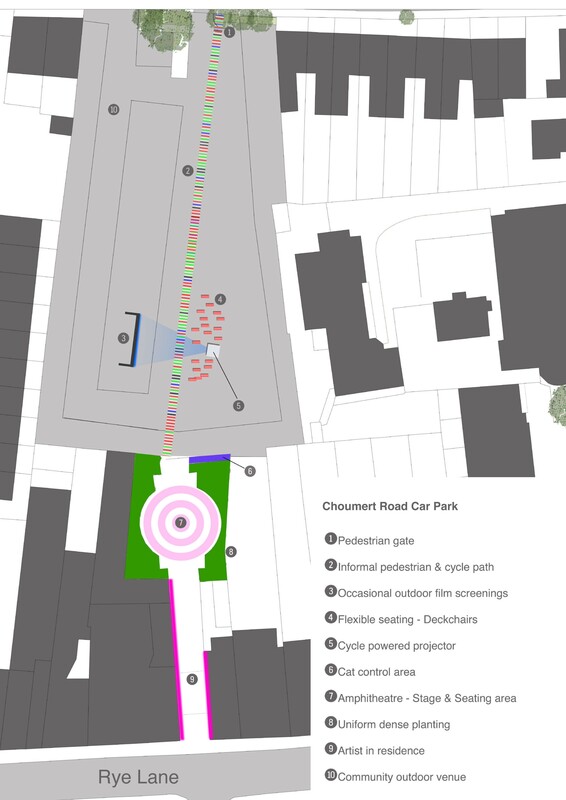 Reinforce the currently informal walking and cycling route from Choumert Grove through to Rye Lane using lighting and/or colourful surface treatment. Declutter the bins and landscape the green area. Provide a designated cat feeding area to concentrate and control the food in one area. Brighten the corridor with a rotating artist in residence programme working with local art institutions. Planting on top of the toilet block to disguise it. Greening the roofs of the garages in Bournemouth Close and potentially house a bee hive there. Provide bin stores to hide and tidy industrial bins away. Removing bollards and replace with planters where necessary. Raised beds for growing food. Lockable compost to be operated on a trust system with local bsuinesses and traders composting their food waste. Flexible seating to be managed by local buisness. Bringing the voices of the local community into the space through a series of stories gathered from local residents. Regularly used cut through from Copeland Road car park to Atwell Road reinforced with a path illustrated with stories. Mural illustrating the stories of residents with access via QR code to digital material from the workshops. Informal play area, with either generic court markings or Ping pong. As is being suggested for the area on Rye Lane in between Elm Grove and Moncrieff Place a suggested raised table using a temporary road surface treatment. This will warn drivers not to come around this corner too quickly. There will be opportunities to get involved, so please ask to be added to the mailing list or check back on the blog for info. Full trials will happen in Spring but there will be a few opportunties before then so watch this space! Some great ideas, well done to those involved. In regard to the Holly Grove area I feel that the design proposals could be much more radical. There is a lot of replication of paths across the area. There is a pavement on the north side of Elm Grove, a pavement on the south side of Elm Grove, a foot path east west through the square, a pavement on the both side of Holly Grove and a pavement on the south side of Holly Grove. Are all these hard surfaces really necessary? Along Holly Grove there are also two pavements and one footpath. Could the railings along Holly Grove be removed to open this area to the street? The narrow pavement on the north side of Holly Grove could then be removed and the park extended. More radical still would be only allowing parking on the south side of Holly Grove and add this extra three meters to the park. 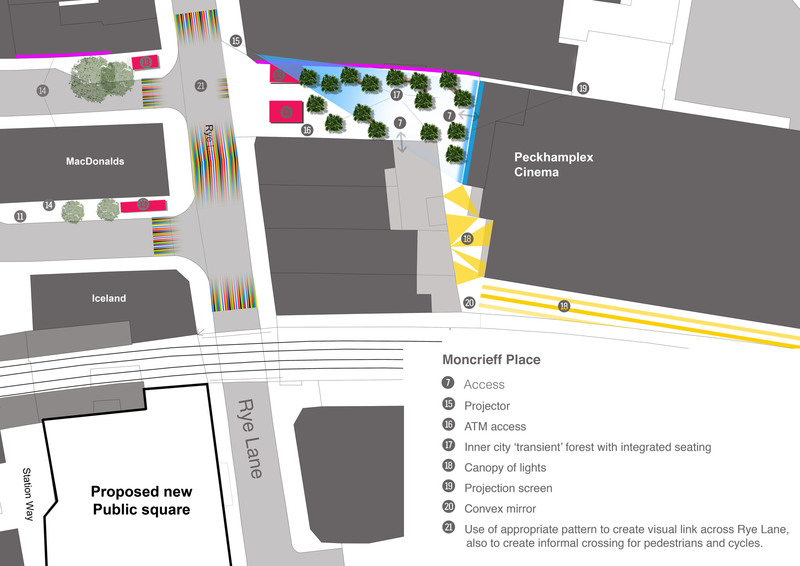 this would start to make a linear park all the way from Warwick Gardens throughout to Rye Lane. Large areas of road in Elm Grove and Holly Grove could also be incorporated into the pocket park. Why does vehicular traffic need access to the section of Elm Grove in the north west corner of the site? Also the same question can be asked as regards the south east area of the site (Holly Grove). I am not sure that the play features are in the right place, (near to an area with delivery trucks). Also play features incorporated into grass are nearly always unsuccessful due to maintenance issues, (see play area in St Mary’s Churchyard in Elephant and Castle). I would like to involved with this project. Please contact me. Thanks for all your thoughts on the Holly Grove site. All really interesting considerations, many of them are outside of our scope in terms of making those changes permanent but it may be possible to suggest them in some temporary way in the space. Where we have indicated the brown surface treatment over Elm Grove this could be extended to cover other areas. However we are likely to be very much restricted by the highways department at the council with regard to this but that is not to say we can’t discuss it. Thanks for your comments on integrated grass play shapes, the location is a suggestion and not fully planned out, however they are towards this end so as to animate this area more. In terms of maintenence we had the same concerns and as a result these play shapes may not be integrated but could use another approach. I have added your email to the mailing list and would be happy to meet to discuss these details in person if you would like? As a resident in Holly Grove for over 12 years, these plans and ideas would completely reverse the civilised and historic quality of the area. The Holly Grove Conservation Area has been in place since the 1970s and is one of the few gems in Peckham that refers to its past and place in south London’s development. To remove railings, pavements in favour of a free-for-all open space would do nothing to enhance this quiet backwater, which despite changes further afield has not really altered in decades. The residents in the whole Holly Grove Conservation area, including Lyndhurst, Elm, Highshore etc, all have a huge emotional investment in the area and have watched it slowly mature and preserve itself with self-governing maintenance and improvement. It would be a pity to sweep aside this sense of history and civility for a few tick-box ‘improvements’ that will be short-lived and which duplicate similar ideas already in place. If there is money to spend, there are many greater problems that Peckham has to contend with that might appreciate some attention. Many thanks for your comments. We do appreciate the historic nature of the shrubbery and in no way want to diminish it’s character. However, our approach for the end of Holly Grove behind McDonalds aims to tackle some of the imact that the transport and urban planning has had on the function of the green area for residents. By changing the surface quality, particularly of the central path, the park becomes unified rather than appearing as two strips of grass surrounded and divded by concrete. I have been contacted by a number of Elm Grove and Holly Grove residents and I feel that it would be best to all meet to discuss the plans in person. With your permission I will keep your contact details and invite you to a meeting once it has been arranged? Thank for all the thought and hard work, but in my opinion this isn’t a relevant scheme.Too many small items, without any overarching vision. 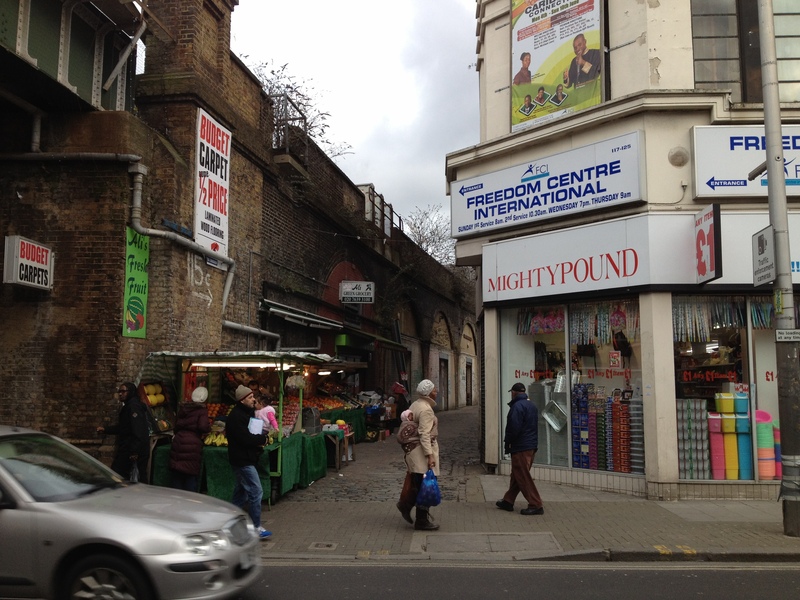 Peckham Town Centre is a thriving multicultural shopping precinct. 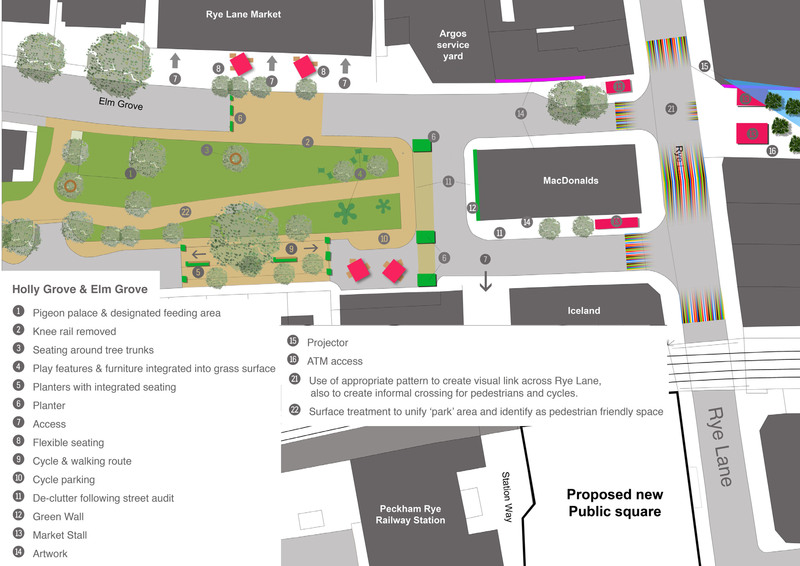 Seating around trees, raised beds, new paths, a few murals, and pigeon hotels are not going to cut it. Re the plans for the shrubbery on Holly Grove. For me it is currently a working space that is used and loved as a quiet space for refuge and thought. Warwick gardens serves the community as an activity space for outdoor sport and for children let off steam. The 2 spaces in conjunction serve the local community well. If there is funding, then it would seem better served to improve the shrubbery by replanting the trees and shrubs that have fallen away. Thanks for your comments. It is interesting to hear that you actively use the Shrubbery for peaceful reflection, does this include the area at the end of the Shrubbery right behind McDonalds? I would also be interested to know where the trees and shrubs that you refer to once were and why they are no longer there. I know that there has been some effort via Cleaner Greener Safer by the police to reduce the size of the shrubbery in order to combat crime. Just one of the considerations for this complex area. I have been contacted by a few of your neighbours in the Holly Grove area and think it best to set up a meeting to discuss the plans in person. If you don’t mind I will save your contact details and send you an invitation to that once it has been arranged? over the past 10 years, as trees have died/ fallen over in storms they have never been replaced. I did a stump count and there are 8, there were also 2 smaller trees that were dug up when they died. the recent work by the Parks Authority to clean up th epark which has been great, as removing the overground ground shrubs means it is less easy to nip in there and take a dump. Were you aware that when the Parks men finished cleaner the area they had found 6 syringes and 1 gun. A pigeon palace and boulders is not going to help. I am seeing you on monday at the liberal club. 3. the palace drawing pigeons away from their existing perching places, but as a high density area there are so many roosting places there is no way to move. I have really tried to understand your thought process behind this scheme and i am totally baffled and cannot see any logic. The problem is not pigeons but people dealing in drugs, muggings and sexual assaults. Recommending a palace is bizarre. There are already 2 Southwark Council signs on that little piece of green that clearly state that the feeding of pigeons is prohibited. Maybe what the place really needs is some bigger signs.